What is the best wedding dress for your body type? If you’re that body conscious lady, am sure I am about 90% correct most times. The wedding day is probably the most important day in a person’s life. With girls, this day holds, even more, value to us, since we have spent most of our childhood and our teenage years looking forward to this one day. Each time we have imagined our big day, we do so in a way that we see ourselves with the love of our life while also looking the best we ever have. The joy of having the entire family and friends celebrating us, the thrill of saying yes I do, the endless wait for the priest to say…” you may kiss the bride” all add to the anxious wait for this day. Trust me, the Nigerian Wedding day is just the bomb. You will agree with me if you have seen the movie “The Wedding Party 2“. I guess you relate to the bride character in this movie. There is nothing unheard of about the fact that the girl wants her wedding day to be entirely perfect, from the food to the makeup, to the hair, to the wedding dress. The wedding gown plays a vital role in making your day all that you ever imagined it to be. Therefore, it is essential that when looking for a wedding dress, we should take into consideration the need to dress for your body type. Why is Your Body Shape Important? The wedding dress that will look perfect on your wedding day heavily depends on your body shape and your body size. It is important to note that there is no ‘right’ body shape but we are all built uniquely and different styles seem to work for different people. Just because you have seen a pretty wedding dress look amazing on a friend or a family member does not mean that it will flatter you as well. There are some common body shapes out there. And no matter how much weight you gain or lose, your body shape is likely to remain the same your entire life. Therefore, it is always important to check out the best wedding dress for your body type. Here are the best styles for different body shapes and body sizes. This body shape is pretty self-explanatory. This refers to women who have wide hips and a wide upper body while having a slim mid-section or waist. For example, wearing a ball wedding gown will mostly never work for a bride with the hourglass figure. Such brides should look for wedding dresses that accentuate that thin waist while also highlighting their curves in the best way possible. The fit and flay wedding gown style will suit best for this body shape. If you are thin and petite, you do not want to be buried under your wedding dress. So going for a wedding dress with huge ruffles and tulles will probably not be the best idea. A wedding dress that highlights your petite features will work best, for example, a knee-length wedding dress with a wide neck. A mermaid wedding gown will also create an illusion of a taller figure and hence match your body shape very well. This is bound to bring attention to all the right features. The first thing to note is that you should never be ashamed of your figure and you should embrace your curves, only then will you feel confident and look radiant. These kinds of body shapes can look best in a floor-length wedding gown. This will accentuate your height and make you look chic. Long sleeved wedding gowns will also add an extra oomph to your wedding gown and you are bound to shine like the diamond you are. Aline wedding gowns may be the best wedding dress for your body type. It will take attention away from your curves and give you a gorgeous look on your wedding day. It is important that we learn to embrace all our beautiful features so we can accept who we are and look amazing while doing it. You want to stand out on your day wearing the best wedding dress for your body type, look picture perfect and have the ideal Nigerian wedding, then this is the way to do it. 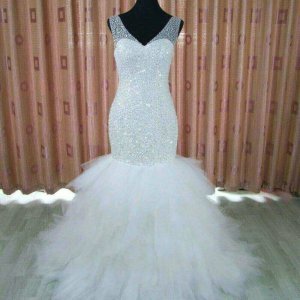 This entry was posted in Uncategorized and tagged ball gown wedding dress, body shapes, bridal gowns near me, Dress for Your Body Type, hadassah bridals, mermaid gowns, plus size wedding gowns, plus-size wedding dress, wedding dress, wedding gown, wedding gowns. Pingback: Can I Buy Wedding Gown for My Bride to Be?